The Fielding Wright Art Gallery at Delta State University is pleased to present “CUBA FOR KEEPS,” an exhibition of photographs by Oxford artist Milly West. Opening with a reception and gallery talk by the artist on March 6 from 5-7 p.m., the show will hang through March 28. West is a nationally recognized photographer whose works are in the collections of the Corcoran Gallery, Washington, D.C.; the Ogden Museum of Southern Art, New Orleans; the Mississippi Museum of Art, Jackson; the Meridian Museum of Art, Meridian, Miss. ; the Brooks Gallery, Memphis; the Center for Southern Studies at the University of Mississippi; and in many private collections. A past recipient of the Mississippi Institute of Arts and Letters Award in Photography and former owner of Southside Gallery in Oxford (1993-2003), she earned a Master of Fine Art in photography at the University of Tulsa, where she received the prestigious Gussman Award in Art. Dr. Michaela Merryday of the Delta State Art Department, who has known West since her graduate school days at Tulsa, said she is excited to see West’s work featured at the Fielding Wright Art Gallery. In 1996, West — formerly Mildred Lewis of Rosedale — traveled to Cuba for the first time, and photos from those travels have been featured in many galleries and publications. Since then, she has made over 30 trips, making thousands of images. On her early trips, she often found similarities between Cuba and the Mississippi Delta, where she continues to work, often in the Clarksdale area. She is drawn to photograph the people of the Delta and of Cuba because of the similarities they share. Her photographs show a simple life in both places, punctuated with strong elements of color. She seems to look for the unfamiliar and finds it, especially as she interacts with the art scene. In this exhibit, viewers will see photos taken in the homes of artists and friends, as well as Havana in the rain, Hemingway’s house and books, tourists on the veranda of the Hotel Nacional and much more. All images in the show are in her new book “CUBA FOR KEEPS,” which spans 24 years of travel, and which will be available for sale at the gallery opening on campus. The book is $35 and includes 56 pages of color photographs, along with a personal narrative about her relationships in Cuba. 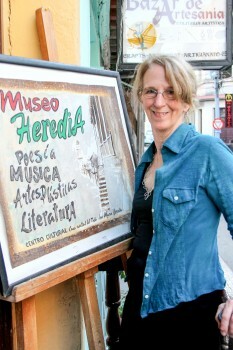 West’s gallery in Oxford, Tres Puertes, specializes in Southern and Cuban art, as well as her color photography. She may be contacted at her gallery for further information about her work. Just back from a recent trip to Cuba to present her book in Havana and Santiago de Cuba, she will now begin on a new collection of photos of the American South — especially Mississippi and Arkansas, where she is finding another culture that appeals to her. The community, students and faculty are cordially invited to attend the opening to meet West and enjoy the gallery talk. Gallery hours for the remainder of the show during March are Monday-Thursday, 8 a.m.-8:30 p.m. and Friday 8 a.m.-3:30 p.m.